Q: What Is The Parking Situation At The Tremont? A: We offer valet parking for $18/night plus tax. This allows unlimited in/out access 24-hours/day. Guests also have the option to park on the street, which is metered. The City of Galveston charges for metered parking Mondays thru Saturdays from 9 a.m. to 6 p.m. Guests may pay at the pay and display stand or through a PayByPhone App. A: Guests that choose to stay at the hotel prior to their cruise can do so and be shuttled to the port. Valet park the night that they stay at the hotel then on the morning of their cruise relocate the vehicle to Hotel Galvez. Guests are then transported from Hotel Galvez to and from the cruise port. Shuttle reservations should be made at the Front Desk when checking in to the hotel. A: We have a complimentary shuttle that is free based on availability around the downtown areas. We offer a shuttle between our sister hotels seasonally. Check with the hotel for details and times. Additionally, the City of Galveston has resumed its Trolley operations. There is a trolley stop at 23rd and Mechanic. A: We allow animals up to 25 lbs. A $100 non-refundable fee is required. Click here to view our policy. A: Cancellations should be made at least 72 hours prior to arrival to avoid a fee of one night's room/tax. ** Advance Purchase and other non-refundable reservations may not be canceled due to the nature of the reservation. These reservations require full payment and cannot be amended once booked. Q: Can I Check In Earlier Than 4 PM? A: Late checkouts are granted based on availability. Please see the Front Desk for details. A: We have small refrigerators available on a first come, first serve basis for $20/day. We do not offer microwaves. You can view all of our in-room amenities here. A: We do not have a pool on-site. 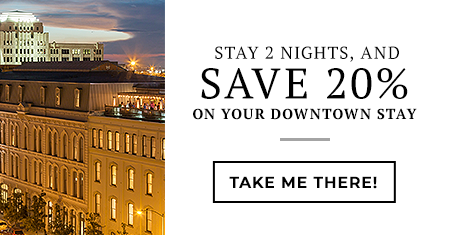 However, Tremont House guests have pool access and signing privileges at our sister hotel, Hotel Galvez. A: We do not have a spa on-site. However, our sister hotel, the Hotel Galvez, has a full-service salon and spa. We recommend that you schedule your service in advance with The Spa at Hotel Galvez by calling (409) 515-2100. You can view all the services here. A: Yes, Tremont Café is open for breakfast lunch and dinner from 6:30 am to 10 pm Sunday through Thursday and from 6:30 am to 11 pm on Friday and Saturday. The Tremont House offers two bars: 1888 Toujouse Bar and The Rooftop Bar. The Toujouse Bar offers live jazz on Fridays and Saturdays.